An RFQ/P goes out. Let the cheering commence. As most of you probably know — because you have exhibited by your readership and comments here that you care deeply about your community — we had a major development yesterday in the long, difficult slog toward a new, single-terminal airport. Mayor Sly James, City Manager Troy Schulte and City Council Aviation Committee Chairwoman Jolie Justus announced that the city had issued a “request for qualifications and proposals” (RFQ/P) for design, construction and private financing of a new terminal. This was like the proverbial dam breaking open…in a good way. Until now, Burns & McDonnell, a local engineering and design firm, was hurtling along at record speed with a proposal to build and finance a new single terminal. At the wheel of the pace car was Sly James, who, until a few weeks ago, had wanted to jam the deal through the City Council in a matter of days. Gratefully, the pace car has pulled down onto pit road, for refueling at the very least. Today, all Kansas City area residents can exhale…And we can, and should, thank the “new” Kansas City Star editorial page and the editorial board members for this breakthrough. 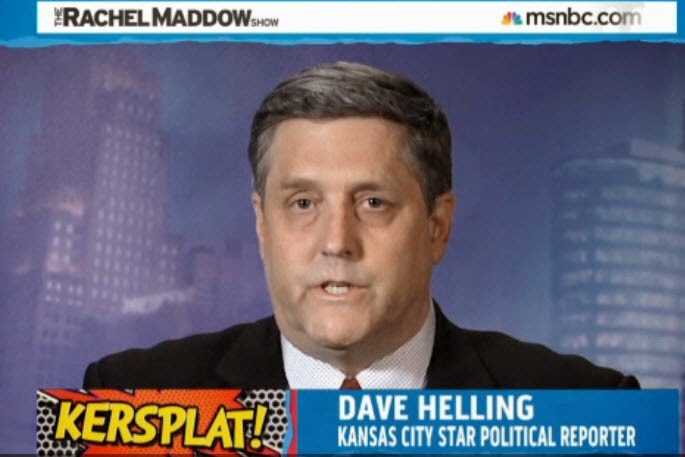 It’s only been three weeks since editorial page writer Dave Helling got wind of the Burns and Mac deal and forced the mayor’s hand — forced him to rush down to the editorial board and lay out the framework of the deal he’d been cooking up with Burns and Mac. Helling’s scoop (you don’t see many “scoops” on the editorial page) was a tremendous public service. If it didn’t slam the brakes on the process, it certainly put a large boulder on the tracks. Since then, the editorial board has hammered relentlessly at the need for the city to slow down and to solicit proposals beyond that of Burns & McDonnell, which has made bountiful campaign contributions not only to the mayor but to every other City Council member. We’d like to see a detailed comparison the private financing plan and a traditional public bond plan. And what will the design look like? AECOM (a California company that has expressed in the project), Burns & McDonnell and any other competitor should provide as many options as possible for the council and public to consider. That is exactly what a responsible newspaper and its editorial board is supposed to do: Shine a strong light on issues that significantly impact the public, take a carefully considered stance and push like hell for elected officials to do what’s right. Helling, who has written all but one of the recent, unsigned KCI editorials, told me in an email that not one member of the editorial board was in favor of the city giving the contract to Burns and Mac without seeking other proposals. …Nothing could be bigger than how the city proceeds on a new airport, which will probably cost about $1 billion. It is the biggest single municipal project many of us will see in our lifetimes, and it can’t be rushed through in a week, or two or three, and it can’t blithely be handed over to a local firm, no matter how qualified and/or well-intentioned that firm is. I’ve said before I like Sly James and that he has been an effective leader. As a political novice with a first name that most wannabe politicians would eschew, he put together in 2011 the best grass-roots, local campaign I have ever seen. But on the airport he allowed his frustration at years of being stiff armed to get the better of him. So, he threw down a trump card, and it backfired, triggering a fortnight of public confusion and opening himself up to harsh blowback from longtime critics. At the same time, as I’ve said before, the dust storm that blew up over the Burns and Mac deal has advanced the KCI debate beyond whether or not Kansas City needs a new single terminal. More and more, people are coming around to the realization that it is the way to go…It’s possible our mayor is crazy like a fox. At any rate, the trump card is now back in the deck. Burns and Mac may still win out, but the public is going to see other proposals and, ideally, get a much clearer picture of three important components of a possible private deal: how much a new terminal will cost, how a private firm and its partners stand to profit, and how much money is in it for a private firm and its financial partners. Besides those three big questions, another that has drifted off in the backwash of the Burns and Mac proposal is what the new airport might look like. On a project of this magnitude, what could be more important, at least initially, than the design? On that front, I fault The Star and the Aviation Department. The Aviation Department and the airlines have settled on a preferred design, but the city has not produced good, definitive representations. 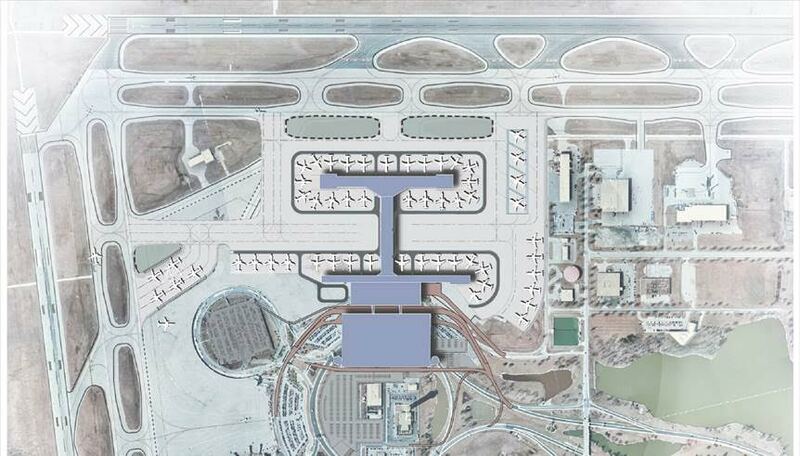 For its part, The Star has published several images of new-terminal and major-renovation options (there are two of each), but I’m almost certain it hasn’t run the preferred option since the Burns and Mac deal took front and center stage. When it comes time for a public vote, possibly in November, whatever proposal is put before the public will rise or fall just as much on an appealing (or unappealing) design as on price and other financial considerations. With that, let me show you again (I first ran it on May 15) what the city calls NT-A, as in New Terminal-A. The squat, blue rectangle below and attached to the bottom bar of the “H” is the new terminal building. The larger blue rectangle, slightly separated from the terminal building, represents a new 6,500-space parking garage. Below that, in the gray circle, would be a surface parking lot with an additional 1,940 parking spaces. The circle to the left of the terminal and parking garage represents the existing Terminal B garage, which would be retained, primarily for employee parking. One of the fascinating things about being a Kansas Citian, for me, is seeing different names pop up in conjunction with big projects and then trying to figure out just who those people are and how integral they are to the issue at hand. Thanks to good spade work by two enterprising business reporters — Mark Davis and Steve Vockrodt — we were introduced in Sunday’s Kansas City Star to an extremely important figure in the Burns & McDonnell single-terminal-airport proposal. He is Michael A. Merriman, chairman of an insurance company called Americo Life, with offices near 11th and Broadway. Americo is a 50 percent partner, along with a Burns and Mac subsidiary, in the airport proposal, which the City Council is planning to vote on on Thursday, June 15. It is Merriman, through his company and its connections, that will put together the private financing package for the proposed $1 billion airport deal. 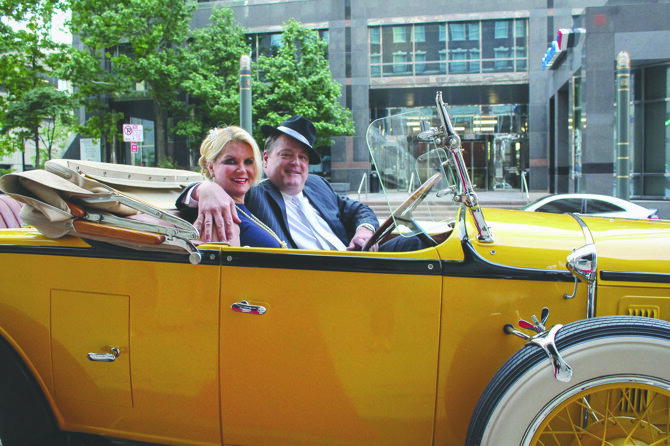 :: Merriman is the third generation of a family that started its business in Kansas City nearly a century ago. :: Merriman’s father, Joe Jack Merriman, was at one time president of the Waddell & Reed mutual fund company. It was he who got the family into the insurance business. After Joe Jack moved to Palm Beach, FL, in 1994, Michael took over the reins of the family business, and it has grown significantly under him. :: Americo and Merriman are closely linked with Kansas City-based DST Systems, and they worked together on redeveloping the west side of downtown, including Quality Hill. …As enlightening as it was, The Star’s story left me wanting to know more about Michael and Joe Jack. So, that’s what I did, and whattya know? There’s Michael A. Merriman on Indian Lane. White Pages says he’s 60, has a relative named Ellen and previously lived in Lake Lotawana. :: Joe Jack had married into a Kansas City family named Atha (Michael’s middle name). That’s an old Kansas City name, associated with Folgers Coffee. Back in the early 1900s, Frank Atha, Folgers’ top salesman, was responsible for the company’s exponential growth when he convinced the Folger family to open coffee plants in Texas and Kansas City. Two sons and other descendants followed Frank Atha into the business, now owned by the J.M. Smucker Co.
:: Michael, one of Joe Jack’s two sons, graduated from Southern Methodist University in 1979 with a bachelor’s in business administration. Michael’s wife, Ellen Merriman, and all four of their children are also SMU graduates. Another tidbit about Merriman — which I got from The Star’s story — is that he is a Republican and has made at least 11 contributions to U.S. Rep. Sam Graves, another pivotal person in the airport deal. Until last week, Graves had been the single most significant opponent of Kansas City constructing a new single-terminal airport. Two of the City Council’s four Northland representatives, Teresa Loar and Heather Hall, were also opposed, and their opposition appeared to be a big impediment to progress. But last week Graves endorsed the deal, which will probably prompt Loar and Hall to follow suit. What prompted Graves to change his mind? I theorized in a post a few days ago that the two main factors were 1) the city, which Graves doesn’t trust, would be marginalized in the Burns and Mac deal, and 2) Burns and Mac contributed $7,500 to Graves 2016 re-election campaign. Yesterday we found out another Graves contributor, Merriman, would be orchestrating the finances. Since I’m having a spot of trouble convincing people to get on board my No. 1 crusade — getting a first-class airport for a first-class city — I think I’m going to start another one. How about this: A first-class jail for a first-class county? I’ve never seen the confinement areas of the Jackson County Detention Center, so I don’t know first-hand how serious the problems are at the jail. But from what I’ve been reading, it sounds bad. Inmates and their families complain of crowding, broken plumbing, grime and fear of spending even a short amount of time within a facility where there is no assurance of safety. Assaults occur in areas where guards and cameras can’t see. The baddest of the bad have sometimes roamed freely to commit sexual assaults and beatings in the middle of the night. During the past year, the county spent about $3 million on jail improvements, including replacing several hundred cell doors — doors that would no longer lock! Now, it would be hard enough spending time in that, or any, jail but to be in a cell where the door doesn’t lock and “the baddest of the bad” are roaming around in the night….??? Holy crap. And, no, I’m not talking about a Taj Mahal, just a place that’s tolerable. The vast majority of inmates at the detention center are just passing through — either awaiting trial or transfer to another facility. But they are often there for months, and they don’t deserve to be living in miserable conditions. When I read that a new jail should be a single-level facility — which makes sense and is the style of most relatively new state and federal prisons — it struck me that if a facility like that was going to be built downtown, it would take up at least a full city block, maybe more. I noted that in an email to Hendricks, and he responded that a new jail “most likely would not be downtown.” And that, he said would present another problem — how family members of inmates would get to and from a more removed jail on public transportation. But that’s a problem for another day. The immediate problem is what to do about a badly deteriorated facility that opened in 1984 and was overcrowded from almost Day One. 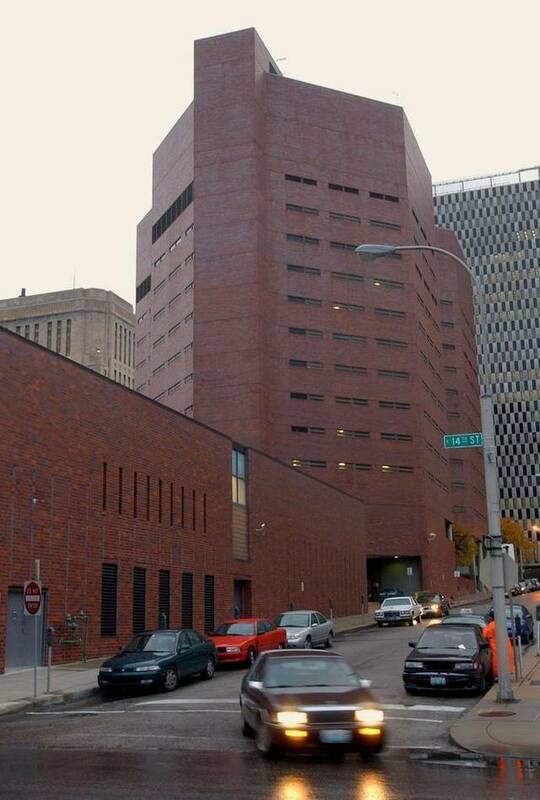 When I came to Kansas City in 1969, the jail was on the top five floors of the Jackson County Courthouse. I covered the courthouse for the newspaper from 1971 to 1978 and saw that jail many times. My most vivid memory from it was following along as a prisoner who had been arraigned on a murder charge was hauled up to the 11th floor, all the while screaming, “I didn’t do it! You’ve got the wrong person! I’m innocent.” Those shrieks sounded like they came from the soul of an innocent man, and they shook me up. Sure enough, the next day the charge was dropped and he was released. History is now repeating itself. The jail that opened 33 years ago is broken down and beset by violence. So now I ask you, if you can’t or won’t join me in Crusade No. 1, get on board Crusade No. 2. I want to see a jail where the cell doors lock, the plumbing works and where the inmates live in humane conditions. Sure, there are some bad hombres in that jail, but the majority should not have to live, day after day, night after night, in a hell hole where the toilets don’t flush and “the baddest of the bad” go around buggering fellow inmates. Yesterday, two major developments took place that sealed the deal, although the City Council won’t officially vote on it until next month. The first was Kansas City Star reporter’s Lynn Horsley’s online story that said Burns & McDonnell had, in recent years, made campaign contributions to Mayor Sly James and all 12 other council members. The second development was U.S. Rep. Sam Graves’ announcement that he was essentially endorsing the Burns and Mac proposal. Until yesterday, his public position had been steadfast opposition to city construction of a new single terminal. 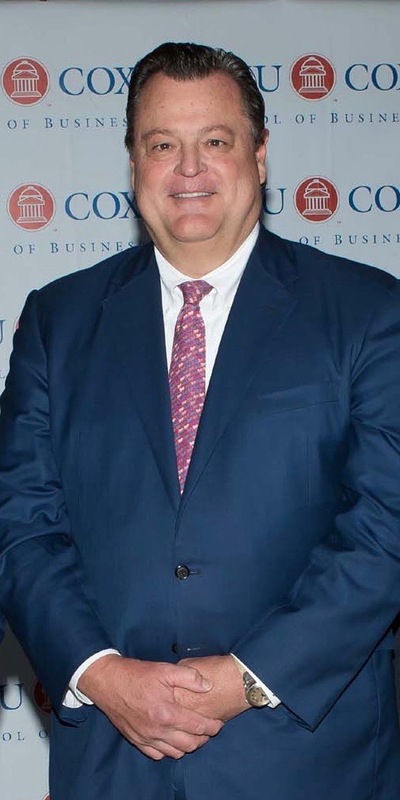 In the last quarter of 2013 alone, Horsley reported, Burns & McDonnell employees contributed more than $50,000 to James, including more than $37,000 at a single fund-raiser on Nov. 6 that year. In regard to the single-terminal proposal, however, Burns and Mac’s contributions to James are less important than its generosity with the other council members…And what a smart move that was, the company and anticipating it would need the council’s help on any number of fronts. Horsley specifically named five council members, besides James, who benefitted from Burns and Mac’s generosity before and after the 2015 city elections. They are Councilman Quinton Lucas ($5,125); Councilman Lee Barnes ($5,250); Councilwoman Teresa Loar ($3,625); Councilwoman Heather Hall ($1,575); and Councilwoman Katheryn Shields ($2,625). After a two-hour-plus City Council discussion of the proposal last week, I could not have predicted with certainty that any of those five would vote for the Burns and Mac proposal. I still wouldn’t say that, strictly on the basis of these reported campaign contributions. But…combine those contributions with yesterday’s other development, and the picture comes into pretty clear focus. Graves, of course, is a Republican, and the Burns and Mac proposal is a classic Republican deal: A private company, not a government agency, takes full responsibility for construction and debt retirement, and also gets the chance to make a nice profit along the way. Exactly how the company profits — and to what extent — we don’t know yet; that hasn’t been spelled out. Graves has never trusted the city. He hated the Power & Light District deal, which left the city paying millions of dollars a year to retire debt, and The Star noted yesterday that Graves has a distinct “lack of trust in the Kansas City Aviation Department.” The Burns and Mac deal would relegate the Aviation Department to a supporting role, instead of landlord and owner riding herd over every aspect of the project. That has to appeal to Graves. 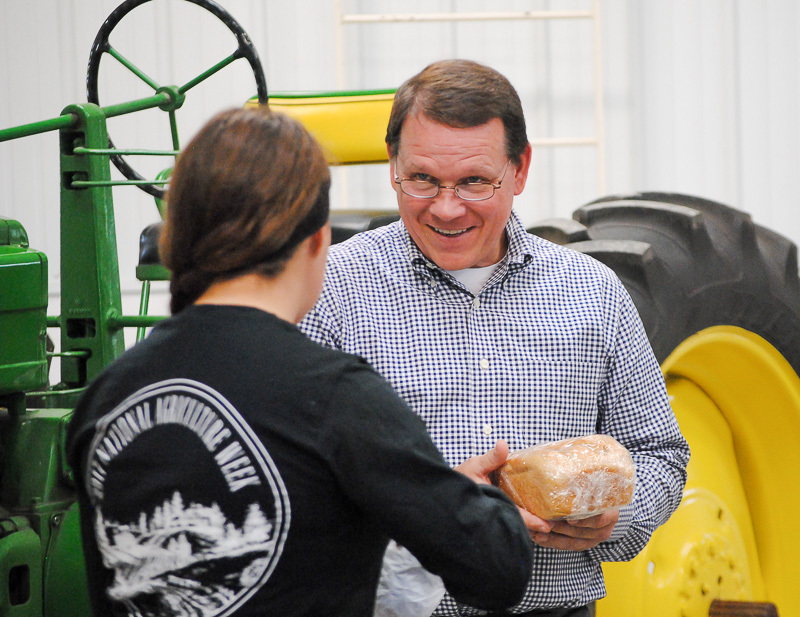 Campaign contributions could also be a factor in the Graves endorsement. Both The Star and the Kansas City Business Journal reported Graves’ announcement, but neither reported what I found on the website ioncongress.com — that Burns and Mac contributed $7,500 to Graves, apparently in his 2016 re-election campaign. Whatever prompted Graves to capitulate, the significance of his shift cannot be overrated. His district lies almost exclusively north of the Missouri River, and four City Council members come from north of the river. He is their congressional representative, and they would be very unlikely to take a stand in opposition to his. The four Northland council members are Mayor Pro Tem Scott Wagner; Councilman Dan Fowler; and Loar and Hall. Of those four, only Wagner, as I saw it, was a solid “yes” vote for the Burns and Mac proposal before yesterday. Now, I think, all four will vote for it. Taking stock, the private-build proposal needs seven votes to pass. 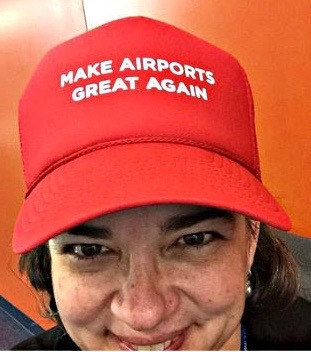 Last week, I saw only five solid votes for the proposal: Sly James; Scott Wagner; Jolie Justus, who heads the council’s Aviation Committee; and Kevin McManus and Scott Taylor, both of whom live in the 6th District, where Burns & McDonnell has its headquarters. Now, we add in Fowler, Loar and Hall. That’s eight. That leaves Lucas, Shields, Barnes, Alissia Canady and Jermaine Reed unaccounted for. Where do they go? Well, if they decide to oppose the ordinance, they will be in the path of a snowball rolling down hill. Not a place you want to be. In addition, they all got campaign contributions from Burns & McDonnell. It could end up being unanimous. I joined about 100 people today at a City Council business session that focused on Burns & McDonnell’s recently unveiled proposal to build a new terminal at Kansas City International Airport and to assume financial responsibility for the job, seemingly relieving the city of risk. At a council legislative session following the business session, Mayor Sly James and Councilwoman Jolie Justus introduced an ordinance that would approve the memorandum. Burns and Mac wants the council to act by Thursday, June 15, in order to prepare a set of “definitive agreements” that Kansas City voters would decide on in November. Under the memorandum, the city would retain ownership of the airport. But for a term of 30 to 35 years, Burns and Mac, through a recently created development firm called Terminal Developer LLC, would lease the new-terminal construction area from the city. The memorandum calls for “approximately $85.2 million a year” in airport revenue (including airline landing fees and gate rentals) to go toward paying off whatever debt Burns and Mac incurred to build the new terminal. …I am convinced Burns and Mac has good intentions in this deal, and no doubt it is a great company. I am proud they are in Kansas City, and you only have to look at their magnificent new headquarters — which they designed and built — at the juncture of Ward Parkway and Wornall to see they are capable of executing a big job. In addition, they are one of the top airport design and construction firms in the country. :: How much of a voice would the public, or even the city, have in design of the terminal? The design is going to be every bit as critical as construction itself. :: How much money would Burns and Mac stand to make? If $85.2 million a year (a staggering amount) would be going toward retiring the debt and $65 million, let’s say, is needed to retire the debt, does Burns and Mac keep the difference? :: By ceding control to Burns and Mac, what assurance would the city have that the work was being done to specifications and that shortcuts weren’t being taken? :: And what if, at the end, the terminal did not meet the city’s expectations or Burns and Mac’s early representations? To help answer some of those questions, the City Council voted 11-2 at its legislative session today to spend up to $475,000 to hire two law firms to help the city review and negotiate a possible deal. That was a very smart move. It was clear at the business session that several council members were still trying to get their arms around even some of the basic elements of the memorandum. Only two council members — Mayor Pro Tem Scott Wagner and 6th District at-large Councilman Scott Taylor voted against hiring outside legal counsel. It appears to me Wagner and Taylor are already committed to the Burns and Mac deal and don’t think the expenditure of several hundred thousand dollars in legal fees is warranted or necessary. I think at least three other council members — a total of five at this point — are solidly behind the ordinance. Besides Wagner and Taylor, Mayor James is unequivocally for it. It’s his baby, and a key element of his two-term legacy is at stake. As I said above, Jolie Justus, chairperson of the council’s Aviation Committee, is a co-sponsor of the ordinance, so her vote is a given. Councilman Kevin McManus, who, like Taylor, lives in the 6th Council District, where Burns and Mac has its headquarters, also is squarely behind it. It was hard to tell, from today’s comments, where many of the other council members stood. I think there are at least two solid “no” voters — Teresa Loar and Heather Hall, both of whom live north of the river (not that that has anything in particular to do with their position). I would not be surprised to see Katheryn Shields vote no. Outside the Council Chamber, she told me she her biggest reservation was that the city could borrow the money for about 3.5 percent, where Burns and Mac’s cost would be 5 percent or more. Like Reed, Councilman Lee Barnes Jr. expressed concern about the proponents’ attempt to get the council to quickly sign off on the memorandum of understanding. Councilwoman Alissia Canady indicated she would be demanding a very high level of contract participation among minority- and women-owned businesses. …When you think about it, that’s not definitive. Sure, he likes the project — most of us do — but does he like the Burns and Mac deal? We’ll have to wait a few weeks to see how this deal unfolds and who, in the end, really likes it. 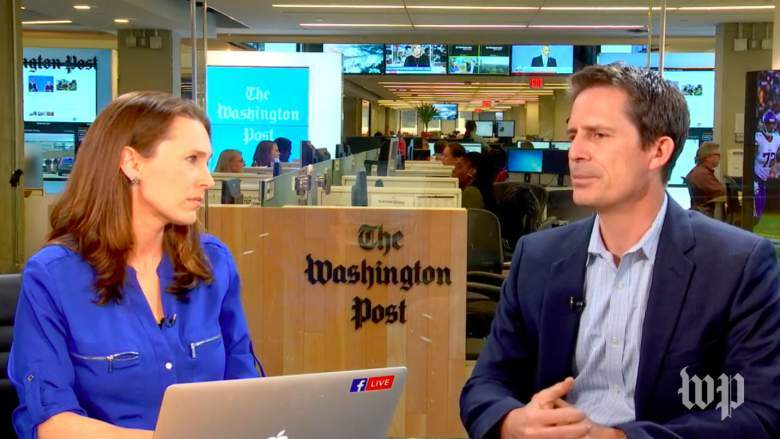 The Washington Post and The New York Times have been taking turns landing haymakers on President Donald Trump’s exposed chin the last two days. For anyone who loves journalism, it’s a BU-ti-ful thing, as former KC Star editor Mark Zieman, used to say. Yesterday, The Times dropped a blockbuster of its own when reporter Michael S. Schmidt reported that, at a private meeting in February, Trump had asked FBI director James Comey to shut down the federal investigation into former national security adviser Michael T. Flynn. Whatever you think of Trump, you’ve gotta love this kind of reporting — and the fact that we in the United States place such high value on a free press. Imagine if this had happened in Turkey, a country spiraling down into autocracy. President Recep Tayyip Erdogan would have every journalist in the country locked up. In Russia? Wouldn’t have happened. Putin already has the press firmly under his heel. No one would dream of writing such a story. Another thing to be thankful for is that the people working for and around Trump are obviously very willing to rat him out. If Trump and a majority of Republicans in Congress are not yet willing to put country ahead of politics, it appears that quite a few White House employees are. This much leaking this soon in an administration is a powerful indication of what kind of president we have. He is so unprepared, shows such bad judgment and has such an erratic temper that he’s not trusted by people who are paid to bolster him and who get the most intimate, unvarnished look at him. Some of them have decided that discretion isn’t always the keeping of secrets, not if it protects bad actors. They’re right. And they give me hope. Greg Jaffe went to The Post in 2009 from the Wall Street Journal, where he shared a Pulitzer Prize in 2000 for a series on defense spending. In introducing him to readers, The Post called him “one of the nation’s top journalists covering military affairs.” He has co-authored at least one book, “The Fourth Star,” about the careers of four prominent Army generals from 1970 through the Iraq war. In 2012, he was honored by the University of Missouri School of Journalism for a series of stories about the growing divide between the American military and civilian society after a decade of war in Afghanistan. 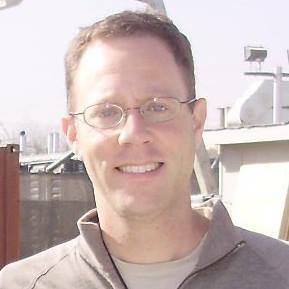 Greg Miller has worked for The Post since 2010. His current title is national security correspondent. Last November, a few days after the election, he reported that the intelligence community had “a sense of dread” about Trump’s impending presidency. Before going to The Post, Miller was a reporter for The Los Angeles Times for more than 15 years. He was among several Post reporters awarded the 2014 Pulitzer Prize for coverage of U.S. surveillance programs revealed by Edward Snowden. He was a finalist for the 2013 Pulitzer Prize for a series of stories on the Obama administration’s counter-terrorism policies, and he co-authored of a book about Americans who interrogated prisoners captured in the war on terror. He has made reporting trips to countries including Afghanistan, Pakistan, Kuwait and Serbia. Michael S. Schmidt is one of The Times’ lead reporters on the federal and Congressional investigations into connections between Trump’s associates and the Russians. In March 2015, he broke the story that Hillary Clinton had exclusively used a personal email account when she was secretary of state. 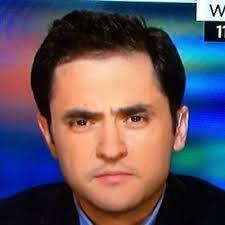 As a Times correspondent in Iraq in 2011, he uncovered a series of classified documents in a junkyard in Baghdad. The documents were testimony from Marines about a 2005 massacre in which Marines had killed 26 Iraqi civilians. Schmidt began working for The Times as a news clerk in 2005. In December 2007, he was made a staff reporter. In 2009, he broke the stories that David Ortiz, Manny Ramirez and Sammy Sosa were among about 100 major league baseball players who tested positive for having used performance-enhancing drugs. The Post, at least, has recorded tangible results from its big story. Glenn Kessler, the paper’s “fact checker,” said the paper’s story about Trump’s revelation of classified information broke the paper’s record for readers per second clicking on the article. Kessler said the newsroom broke into applause at the news of the new record. I say The Post and The Times both deserve sustained applause from all Americans these days. Were it not for a free press, we would be no better than Russia or Turkey.